Normally on Christmas Eve, all the family in the area would get together for a gift exchange or at least a dinner and enjoy each other’s company. This year, sadly, my grandfather is not well and my grandmother decided she just can’t manage to host family gatherings anymore. I knew this day would come eventually but the end of a happy era is always a bit depressing. Add that to the fact that it rained nearly all day today where I am and you have a slightly less than “merry” Christmas Eve. I can’t complain too much, I have a wonderful family of my own now and a lot of things to look forward to in the next couple of weeks. Also, I am luckier than some as I have a little chunk of the Christmas Eve I’m missing: Grandma’s tree. She was cleaning out things she doesn’t need anymore at the house and asked me if I wanted her Christmas tree a couple months ago. I said “yes” without hesitation. When it comes to traditions, I get a little bit sentimental and past me knew that present me was going to feel like this and want something to remember those Christmases by. 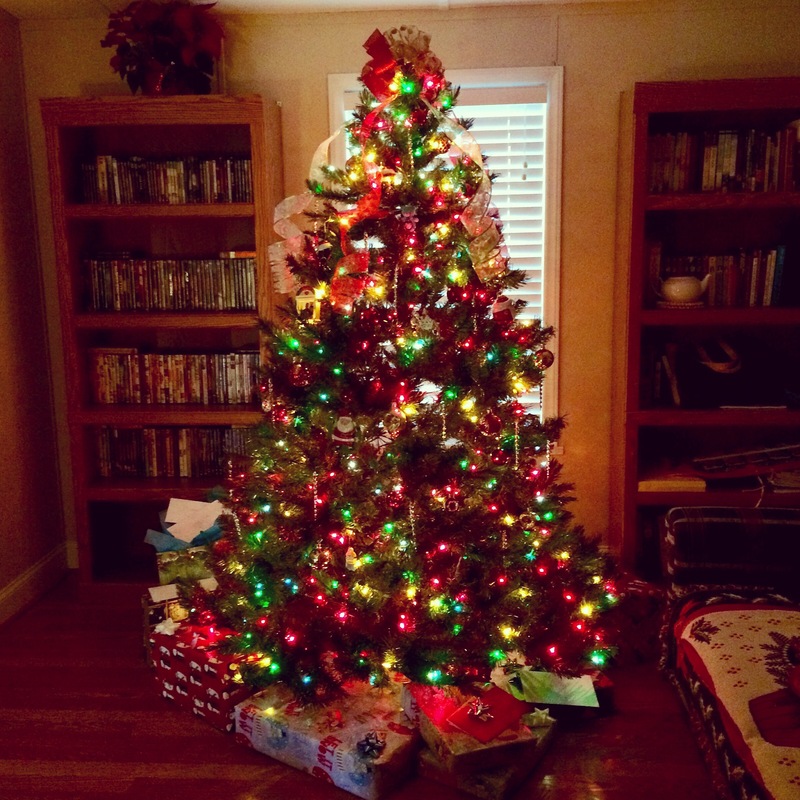 When I look at this tree, I see the massive pile of presents we used to have under it as well as the ones that are actually there. I hear my aunt and cousin playing Christmas carols on the little electronic keyboards as all of us sing along. I taste the peanut butter cookies with Hershey kisses on top that were my absolute favorite. This tree is my ghost of Christmas past, but it’s also my present and my future. My husband’s crazy Santas and Darth Vader/storm trooper ornaments hang on it. Our “Baby’s First Christmas” ornament hangs on it. I decorated it with my signature ribbons and curly-Qs. Future Christmases will bring more ornaments and decorations and hopefully lots of wonderful memories with family. We will welcome visitors to come and stare at our quirky decorations that reflect our own unique style as a family. I wouldn’t change where I am today, but I’m glad I can hold on to a fragment of Christmases past, too. The tree of Christmas Past. May you all have a joyous holiday season (and in case I don’t post before then, a Happy New Year)! Why is it that the courage to write finally came to me at 2:30 AM last night? I foolishly drank a couple cups of coffee between 4-9 PM and ended up with a bad case of the “I’m not tired”s until 4 AM. The good part of the story is that I finally, finally started writing my improved fantasy novel. This is not the first instance of late-night inspiration for me. Why can’t I write at a reasonable hour instead of needing a night of tossing and turning and three hours of sleep to get me motivated? So in this case, on this day, I NEEDED to be awake at 2:30 AM with restless leg syndrome and darting eyes. I absolutely needed an odd scenario to begin work on this novel. Now that it’s started, it will be much easier to continue and maybe I won’t need the caffeine next time. So thank you, coffee. This time you came through for me and I will continue to use you to get through this long day (although I still hate you for costing me precious hours of beauty sleep). Sorry for the rambling… I’m delirious. Exciting updates are (hopefully) soon to come! Thanks for reading!